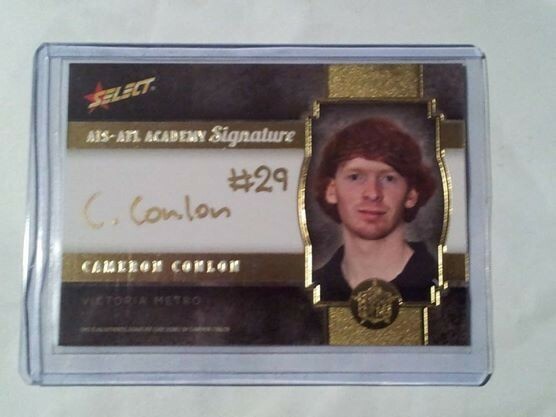 For Sale is a 2013 Select AFL Future Force - Cameron Conlon Gold Draft Signature Card #06/40. Card comes in mint condition and will be sent within 2 - 5 days of payment being recieved. If you have any questions or enquiries please dont hesitate to message me and happy bidding. Edit: All cards are in excellent condition unless otherwise stated. All marks or scratches are on top loaders or due to poor lighting/ camera angle. If you would like a full dscription of the card please dont hesitate to message me. Card sent in Toploader and Bubble Mailer within 2 - 5 business days of money transfer.